There is no end to pizza recipes. Everyone has their special mixture for the dough, the sauce, or pesto. For pizza enthusiasts who enjoy making a hot pie at home, finding that perfect recipe is a mixture of trial and error. However, when you find a pizza recipe that works well for you, you not only want to eat pizza all the time, but you want to serve pizza to your friends. The last thing that you want to have happen is for your beautifully prepared, perfectly stacked pizza to fall apart before you serve it to your friends. That’s why everyone who makes their own pizza also owns at least one pizza cutter. You may be surprised to learn that not all pizza cutters are created equal. Different pizza cutters have different features that make them superior or inferior to others. So for all the pizza lovers out there, what we decided to do was spend a few minutes reviewing the best pizza cutters available. We have divided them into a gold, silver, bronze, and budget category. When we set out to review pizza cutters, we had a few ground rules. 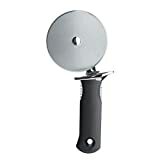 We needed to find a pizza cutter that made precise cuts, allowed us to cut the pizza evenly, was comfortable to use, did not make us worry that we were going to cut off our fingers, and was simple to clean. By all accounts, the OXO Good Grips Pizza Wheel was hands-down the best option. This is a four inch pizza wheel. It has an exceptionally sharp stainless steel blade. One of the nice things about stainless steel, especially when it comes to using it in the kitchen, is that you’re not going to have to worry about it rusting, it’s not going to chip, and even if you use it frequently, it’s going to maintain its sharp edge. Another nice thing about stainless steel is that even though it is hard, it is soft enough that when the need arises, you can sharpen it at home without using expensive tools. We know that there are a lot of fans of thin crust pizza out there. And this four inch pizza wheel can easily divide a thin crust pizza into shareable slices or squares in a matter of seconds. But the real test for us was whether or not this pizza wheel had what it took to cut through a thick pan pizza full of ingredients. And we are happy to say that it made light work of cutting pepperoni, extra cheese, mushrooms, sausage, bacon, and thick crust. One of the reasons why a pizza cutter works better than a knife is because of how it is put together. On the bottom of your pizza, you have your crust material. And this is a thicker material that is bonded to itself with strong cohesion. On the top of your pizza, you have cheese, and that cheese is also bonded to itself relatively well. However, between the cheese and the crust, you have a bunch of ingredients as well as sauce. These items are not bonded to each other at all. So if you use a knife to try to cut your pizza, what you end up doing is separating the well bonded cheese from the well bonded crust, and you end up with a pizza that has no toppings and basically a big mess. The OXO Good Grips product allows you to exert vertical force on your pizza, without creating a horizontal friction. So your pizza cuts clean, and the layers of your pizza don’t separate. You end up with a clean slice of pizza every single time. To this end, the OXO Good Grips tool has a safe diecast zinc thumb guard. This lets you put pressure on the pizza in a consistent manner, while at the same time keeping you safe from accidentally slipping and cutting your hand while you slice your pizza. Additionally, the pizza cutter comes equipped with a comfortable nonslip grip. This means that you can go on cutting pizzas for hours at a time if you want, and your hands will barely feel the work you are doing. Making pizza is a lot of work. It can be messy, and it requires a lot of cleanup. The OXO Good Grips product minimizes the amount of cleanup that you have to do because it is dishwasher safe. You are not going to be scrubbing this item by hand. You can throw it in your dishwasher and forget about it. This is one of the reasons why the OXO Good Grips 4-inch Pizza Wheel is recommended by the American Test Kitchen. This product has also won the Tylenol/Arthritis Foundation Design Award. It has a compact design, with dimensions of 4.9 x 4.1 x .06”. It is light, weighing only 12 ounces. Reviewers on Amazon.com love this product. More than 280 individuals reviewed the product, and 8 percent of them gave the product a perfect score. Some reviewers refer to this product as a hefty pizza cutter. They say that they make pizzas with a lot of toppings and it slices them every single time. Others commented on how comfortable the cutter is in their hand, how easy it is to clean, and how they like the way that toppings do not get stuck between the bracket and the wheel. Time and time again, reviewers refer to this as a high quality product. Very few companies can boast a reputation for creating high quality kitchen products like KitchenAid. For decades, this company has built a reputation by providing products that are uniquely designed to tackle problems that people have preparing food in the kitchen. They have lived up to their reputation with the KitchenAid Pizza Wheel. The first thing you will notice is that it has a circular blade. It is 3 ¼ of an inch in diameter. This means that it is small enough to allow you to make precise cuts as you divide your thin crust pizza, but it is wide enough to allow you to cut through a large pan pizza topped with double cheese and a whole host of toppings. As with all of the products that KitchenAid makes, their pizza wheel is designed to allow you to cut efficiently, while maintaining your safety and your comfort level. One feature that we think you’re going to like is the fact that the stainless steel wheel on your cutter is slightly angled. This slight angle allows you to exert force as you are cutting your pizza, while at the same time not hurting your wrists or your hands. Similar to our gold product, this KitchenAid pizza wheel is made from stainless steel. Stainless steel is designed to stay sharp. And you have the benefit of knowing that this product is not going to rust regardless of how you use it, whether you wash it by hand or if you throw it into the dishwasher. The product is designed with an ergonomic handle that has a finger and thumb guard. This way, if you get a little excited while you are cutting your pizza, you don’t have to worry about slipping and cutting your fingers or your hand. 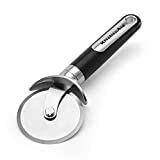 If you are a pizza making enthusiast or if you are simply a person who enjoys having an organized kitchen, you’re going to appreciate the fact that the KitchenAid pizza wheel comes with a little hole that you can use to conveniently hang the pizza cutter in your kitchen. The product has a slim profile with dimensions of 10.8×3×1.1 inches and a weight of five ounces. This product generally received positive reviews on Amazon.com. More than 250 people reviewed the product, and over 70 percent gave the product a perfect score. One reviewer discussed how her husband is a family chef and he rants and raves about how much he loves this cutter. One thing that this reviewer points out is that since the wheel is large, there is enough clearance for her husband to cut through a thicker pizza without the center bolt dragging through the pizza. At the end of the day, it creates a quality slice that the entire family can enjoy. Our bronze product is an essential tool to have in your kitchen. It is a perfect product for slicing through pizza crust and dough. It is a great product that can be used by home cooks or by professionals. You will see that it is made from high quality materials and has an attractive appearance. It will look nice in your kitchen or will fit snugly into any utensil drawer. The Utopia is built to last. It is made from stainless steel. This means that it will not bend or change color. It resists scratching and tarnishing. You will be able to use this tool on pizza, dough, flatbread, and other items for years into the future and it will still look as nice as it did the day you took it out of its packaging. There’s no worry that it will rust or get beat up. You can also be sure that the blade will stay sharp. One thing that we liked about this utensil is that it has a comfort grip. You are able to hold onto the tool firmly, but you will not have any pain in your hands. Individuals who commented on this product on Amazon mentioned that they like the fact that even though they have arthritis, this tool is still easy to use. Another great thing about it is that you can just toss it in the dishwasher along with all of the other dishes used to make your favorite pizza. The Utopia is on the small side, with its dimensions being 9.5 x 4.2 x 1.2 inches. It weighs 8.8 ounces. You will appreciate the fact that it is not bulky, but it’s lightweight makes cutting through crust very easy. We were impressed when we saw that 440 individuals have reviewed this product on Amazon. More than 80 percent gave it a perfect score. Overall, it has a 4.7 out of five star rating. The vast majority of reviews say stuff like good quality, sharp, gets the job done, and great pizza cutter. One individual listed all of the pros and cons. After talking about all of the things they liked about the Utopia, under the cons section, all they said is if you find any, let me know. A couple of individuals mentioned that they noticed that the wheel was bigger than that they thought. They also felt like it wobbled when they were cutting pizza. However, they still gave this product a good rating. We are sure that you will be impressed with the Utopia. However, if you decide to purchase this product, but you are not pleased with it, the manufacturer offers a full money back guarantee. That was another reason why we liked this pizza cutter. In addition to being impressed with its low price, there are several reasons why you are going to really like our budget product. First of all, this product is less than five bucks. It makes it more than affordable for almost anyone. Second, this tool is extremely versatile, durable, and it is an attractive kitchen utensil. We really like this product because it is multipurpose. You can use this tool for more than just cutting pizza. It can be used on flatbread, dough, pastries, pies, cakes, and other food items. You can cut the food of your choice to any size and shape that you want with this strong tool. It can be used by individuals who are just starting to learn how to cook or by professional chefs. Another thing that we liked about the Kitchen Nation is that it has a finger guard. In the moments that you are cutting hot pizza or slicing up your favorite pie, the last thing you are thinking about is protecting your fingers. You are only thinking about dishing up the incredible meal you have made. The finger guard keeps you safe. Also, it is great if you have kids who love to work in the kitchen with you. You do not have to worry about them getting hurt while using this cutter. As we mentioned, this tool can be used by professional chefs and amateurs. In addition to the fact that it is built to last, it also has a superior premium finish. It has a very elegant design that can fit into a professional kitchen or can be tossed into the drawer of a bachelor’s kitchen. It only weighs 5 ounces, and its dimensions are 6.7 x 3.1 x 0.9 inches. This cutter is really made to last. It is has been designed using a long-lasting zinc alloy, making it rust and scratch resistant. It has a comfortable PVC grip. And it is easy to clean since it is dishwasher safe. You may be wondering what real users have to say about the Kitchen Nation. Almost 100 people have reviewed this product on Amazon and have given it an overall 4.7 out of five star rating. Most people agree that it has a great design and cuts a variety of food items without much effort. One individual who reviewed the product said that it has a good weight, a comfortable grip, and is dishwasher safe, which they like. However, they felt that the circular blade was a bit wobbly and that the thinner handle might be uncomfortable for individuals who have arthritis. This individual gave the product a three star rating. 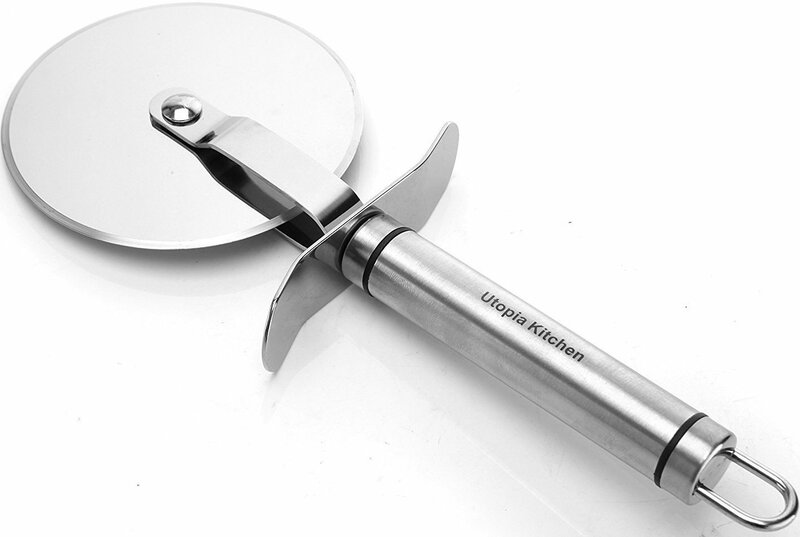 For individuals who are looking to get a quality pizza cutter but not spend a fortune, the Kitchen Nation may be just what they are looking for. 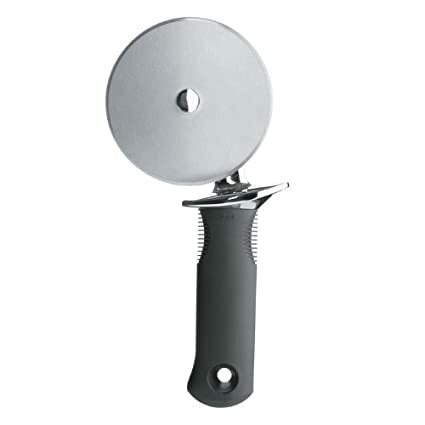 The first thing to look at before purchasing a pizza cutter is the diameter of the blade. You want a blade that is thick enough that it’s going to allow you to cut through even thicker pizzas. Something that you have to remember when thinking about the diameter of the blade is that just because it has a 4 inch diameter does not mean that you are going to be able to cut through a 4 inch thick pizza. The actual cutting depth of the blade is less than 50 percent of the diameter of the blade. Also, you want a blade that is large enough that it will allow you to cut through your pizza without the center bolt dragging through and ruining your pizza. 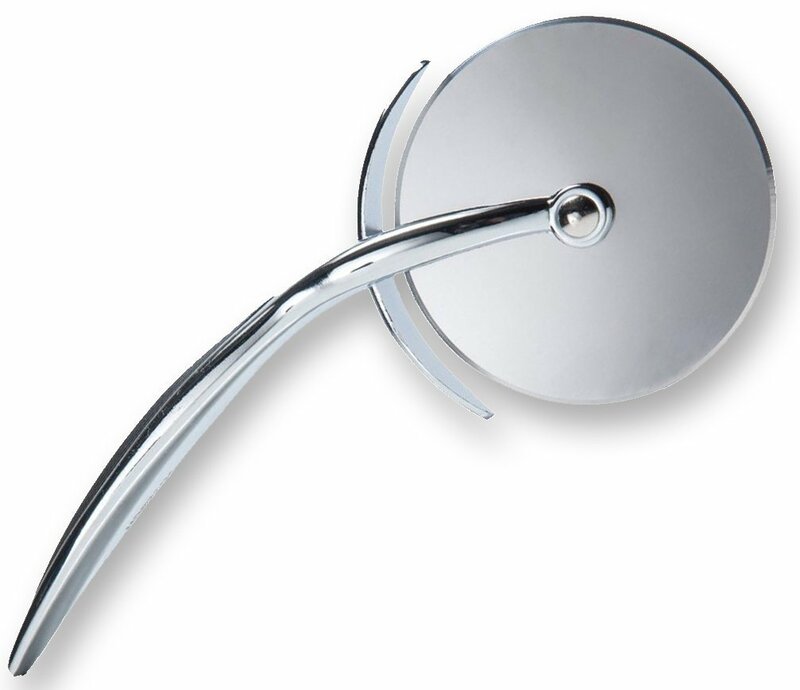 When talking about the handle, there are two things you want to look for. The first one is sturdiness. You’re going to be putting a lot of force on your pizza cutter. The last thing you want is it to break midway through cutting your pizzas. The second thing to look for is comfort. This is especially important if you’re going to find yourself cutting a lot of pizzas. You want something that’s going to fit well in your hand and not leave you with calluses or a sore hand. There are a lot of unique materials for pizza blades, but for money, you can never go wrong with a stainless steel blade. It’s going to stay sharp, it’s not going to rust, it easy to clean, and it can handle the force you will exert on it. The last thing you want to do after cutting up pizza for your friends and family is to spend a bunch of time trying to pick cheese out of a poorly designed pizza cutter. You want to find one that’s easy to clean, preferably one that you can just throw in the dishwasher. A good pizza cutter is going to be sharp. Finding one with a finger or a thumb guard is going to make it a lot easier for you to cut through your pizzas without worrying about injuring your fingers. Since most pizza cutters are relatively small, they are a utensil that you can easily lose. For this reason, buying a pizza cutter that has a built-in hanging hole is a good idea, as you can easily hang your pizza cutter on a kitchen organizing board and have quick access to it whenever you need it. Making pizzas is a ton of fun. It is a mixture of skill and art. Finding the right pizza cutter is just as important as finding the right ingredients for your pizza. A good pizza cutter will ensure that your guests get clean, even slices every single time. We hope our review was able to give you a good idea of what to look for when buying a pizza cutter.